Yes, I do believe the month of May has literally just zoomed past me! I can't believe it's almost the end of the month! I guess the ole saying "Time flys when you're having fun" is true! My parents are still here visiting and we are having a blast. The kids are so excited to have them around. I had to laugh today when the temps went down and we could see a few snow flurries come down tonight. My mom is freezing. Now she knows how I have been feeling adjusting to the weather here. Otherwise the weather has been gorgeous. In other news... I have been stamping. Actually, stamping tons. Just haven't had time to upload the things I have been stamping. I have been busy with workshops and classes. I will try VERY hard to post a few cards that I have been working on tomorrow. Of course it is late, past my bedtime as usual. Tomorrow is Brandons last day of Kindergarten. I hate to admit this , but I am feeling quite emotional over it. Could be PMS, however hearing about two of my friends son's graduating from high school makes me think my kids childhoods will go by so fast. This past year flew by. I was reading one of his writing books that he brought home today. You know, the little sentences they are learning to write on their own. One sentence brought tears to my eyes. "I love my Mom, she is botiful!" I always wonder what he thinks of me and when I read this it gave me the warm fuzzies. Just very innocent. Love that! He had his first Tiger cub meeting tonight and looked like such a big boy in his new uniform. 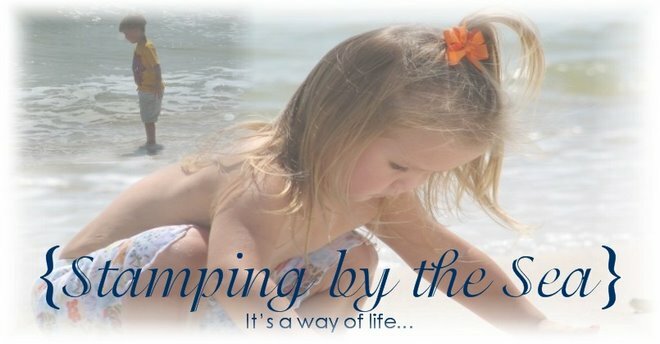 Oh, so stinkin' cute. Well, that is my news. I am just an emotional stamper. LOL! Hello everyone!!! Holy Cow! I didn't mean to take a hiatus like I did. I have just been overwhelmed with so much going on. Lots of GREAT things have been happening and I am just now getting caught up!!! As you remember, I had the bizarre last weekend and it went great. I had a great time and met tons of new people in our area. I love getting to know others. I've been getting caught up in my stamp room as well. I literally had work piled high. I love saying "work" when really it is playing! As far as new projects... well, I have been stamping but I would kill the surprise of my local stampers if I show what I have been working on. UT-OH!!! Here are a few projects I've been working on!! 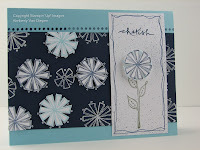 This card is made using the Double Doodle Line stamp set that I received at Regionals. I really like this stamp set. I had to do a lot of cutting for this card, but I like how it turned out. 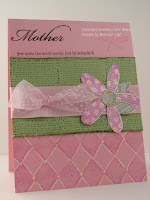 With Mothers Day coming up in just a few days, I thought I would share one of my M others Day cards. If you are a Mother, I hope you have a spectacular day on Sunday! As Mothers, we deserve it. I believe it's the hardest job out there. Today is the DAY! Stampin' Up! 's Retired list is out and WOW are there a lot of stamps listed. You can check out the list HERE! There are quite a few stamps I am happy to say good bye to, however there are many that make me soooooooooooo sad! FRENCH SCRIPT? How can I live without that? I love this for backgrounds. Or how about Girlfriends? I love that set. So sassy! Anyhoo, take a look. If you are on my customer list, you should have received an email about a really cool game and sale I am playing with the retiring list. If you have not received the email and you are interested, just email me. You will find the link on the right hand side of my blog. I am very busy this week. GREAT things are going on. I have a workshop tomorrow and a Opportunity night on Thursday. Saturday I am doing a craft fair at Brandons school. Very exciting stuff this week. I am working like crazy on projects for the fair. Yea! I hope your week is going well. Don't be sad about the Retired list. This just means GREAT things are coming. This time of year is so exciting with Stampin' Up! I just love this company!